The ‘grandfathers of reggae music’ – or perhaps as they are best known – the creators of ska, The Skatalites are a band that lives on through their music. Drum beats, bass licks and all powerful horns that signalled the birth of the mighty Jamaican recording industry and morphed into rocksteady and reggae. The sounds the band created still reverberate in dancehalls today but its original line-up, that was only together for around a year and a half, from 1964, are nearly all deceased. The band first reformed in 1983 and still tours today, squeezing this Wednesday, August 23 show and others, in between festival appearances. The current members hail from the United States, Nigeria and France as well as Jamaica, a perfect example of how the originals took the music of a Caribbean island to the world. Even those more familiar with the musical history than the band’s personnel would have realised this wasn’t an original line-up. More than half of the seven piece outfit looked to be at least half the age of the majority of those in the crowd. Many among, what must have been close to the Albany Road venue’s 350 capacity, appeared more bald than skin head. After some 20 minutes of classic Studio One and Treasure Isle rhythms the ‘Queen of Ska’ and original Skatalite Doreen Schaeffer was introduced to the audience. Sadly her mic didn’t seem to be at the right level so her vocals weren’t as clear as they should have been. But she still injected fresh energy with a version of what, to the mainstream pop market at least, is considered a breakthrough ska record, My Boy Lollipop, as well as Studio One recordings Nice Time, When I Fall in Love and Simmer Down. All may be more commonly associated with other Jamaican performers but that underlines how central The Skatalites were to the development of reggae music. A point they underlined with a commanding performance of the seminal Studio One reggae rhythm, Rock Fort Rock. The near hour-long performance also included an extended version of another of their genre defining hits, Guns of Navarone. Drummer Sparrow Thompson and bass guitarist Brian Atkinson, who was introduced as a Studio One veteran, also had the stage to themselves for a period to showcase their considerable skills and the foundation of the music. Most bands and groups may be dependant on keeping at least a nucleus of their original line-up together but The Skatalites created music and genres that allows the band to live on long since it originally disbanded. This entry was posted in Beats and tagged Cardiff, Jamaican music, Live music, Reggae. 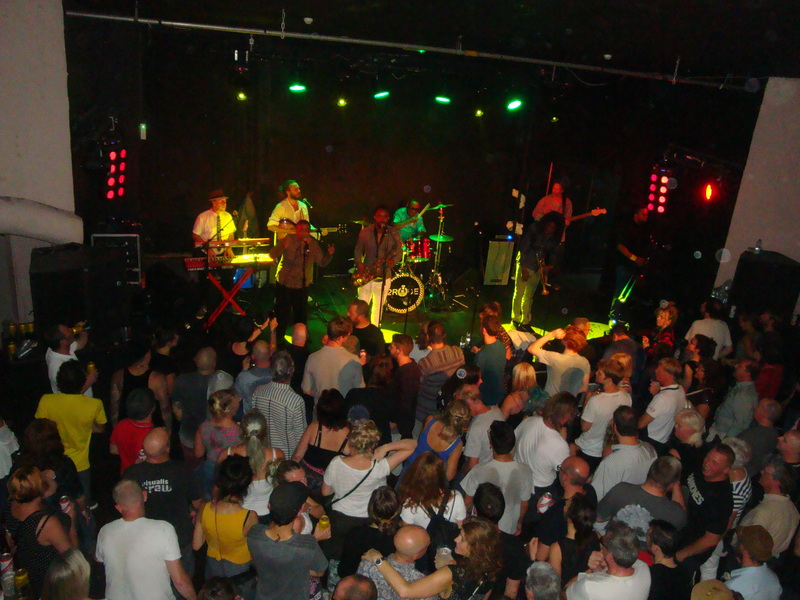 Reggae Music, Roath, ska, The Globe, The Skatalites. Bookmark the permalink.